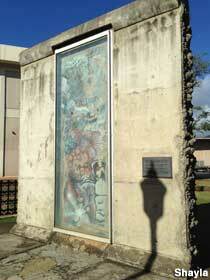 Honolulu Community College has a large Berlin Wall ion display on campus. And we’re not giving it back. As an historian, I am sad to report that what we are seeing in the Ukraine crisis is the tragic unraveling of the Cold War settlement achieved by President Reagan, and the rollback of the West in Central Europe under the current befuddled Obama Administration. I expect that any day now, Honolulu Community College will receive a letter from Czar Putin demanding the return of the Berlin Wall.